I’m not sure about you, but grilling whole fish has been something of a mystery to me. As it turns out it isn’t hard to get an outstanding meal grilling whole fish if you pay attention to a few details. My tips for success are: 1) Make sure you oil the outside of the fish; 2)Use a raised cooking surface and 3) Oil the grilling surface really well. If you do these 3 things you will have a great cook. Once you get the basics down the grilled whole fish becomes a blank canvass for experimenting with different sauces, toppings, etc. 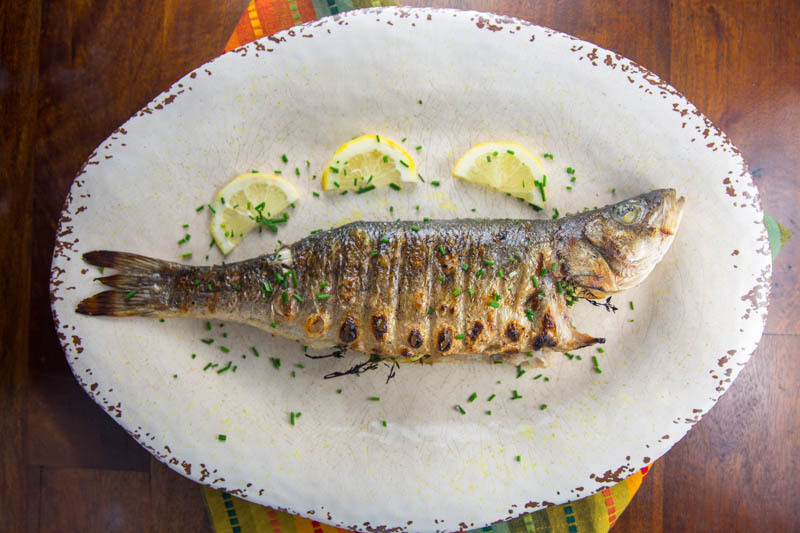 Now sit back, grab a glass of Chardonnay, and enjoy this post for Big Green Egg Grilled Branzino. To prep the fish, rub the outside and inside of the fish with olive oil, salt, and pepper. In addition, place some lemons and thyme in the cavity of the fish. Preheat the Big Green Egg to 450° and grill the fish direct using a raised grid. After the BGE is preheated make sure you oil the cooking surface really well before placing the fish on. While the fish is grilling prep a sauce for your meal. For this cook Mrs. Buddha made an amazing butter, caper, and lemon sauce. Cook the fish 7 minutes per side turning once. Make sure to use gloves or a spatula to turn the fish so you do not damage the crispy skin. Serve the fish immediately with lemon and chopped chives. Paired with wilted spinach and the butter, caper, and lemon sauce, this meal was amazing. This recipe for grilled Big Green Egg grilled Branzino is so good you. The fish is all you need but paired with the lemon, butter, caper sauce this recipe is amazing! In a small saucepan, cook 2 tablespoons of the butter over moderate heat until browned and nutty-smelling, about 6 minutes. Add the shallot and cook, stirring, for 1 minute. Stir in the stock, lemon juice, capers and Worcestershire. Stir in 5 tablespoons of the butter, 1 tablespoon at a time, until incorporated. Stir in the chives. Remove the sauce from the heat and keep warm.